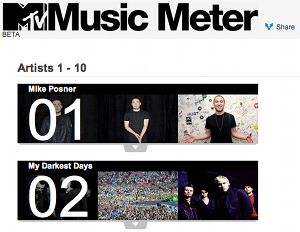 If you like to keep an eye on the latest emerging music, MTV’s newly-launched Music Meter should be worth a regular visit. It’s clear that music sales, whether CDs or downloads, no longer tell the full story about our music tastes. YouTube is a more popular music player than you might expect and social media can influence what we end up streaming via services like Last.fm, Spotify and Rdio. 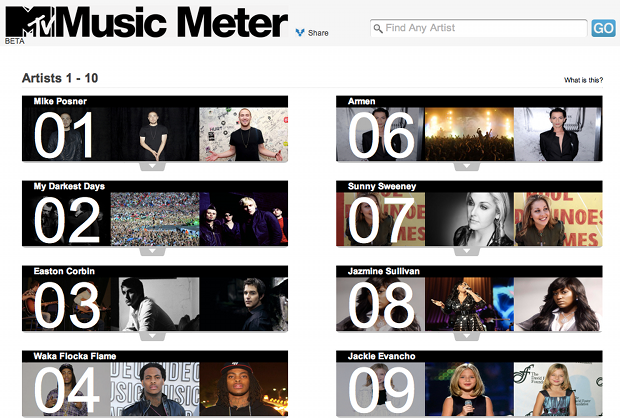 MTV’s Music Meter aims to reflect this new landscape. Billed as a “Music discovery experience”, the Echo Nest-developed Music Meter is a chart ranking online buzz around music acts, taking into account mentions on Twitter; blog posts; news articles; streams and purchases. The chart is updated daily and is designed to allow you to easily discover new artists that may otherwise have passed you by. Click on any artist on the chart and you get access to audio previews courtesy of Rhapsody; videos (which appear to be region-locked to the USA – at least on the examples we tried); a photo gallery; recent tweets relating to the artist; recent related news from around the web and an artist biography. MTV says that a million artists are being tracked and it’s not just major label artists, I managed to find myself on there and I haven’t recorded any music in three years (no, you’re not getting a link!). Tracking so many artists allows the app to offer up plenty of recommendations for similar artists to any that you care to choose, making it an alternative to Last.fm and Pandora for music discovery. The list isn’t entirely automated, an element of curation takes place to strip out the most popular mainstream artists. Shannon Connolly, VP of Digital Music Strategy at MTV Networks is quoted by Fast Company as saying “We chose to strip out the most popular artists that you see dominating all lists – so you won’t see Gaga or Bieber”. Read next: Twitter reveals its "Most Powerful Tweets" of 2010. Can you choose better ones?